Today was so fun! 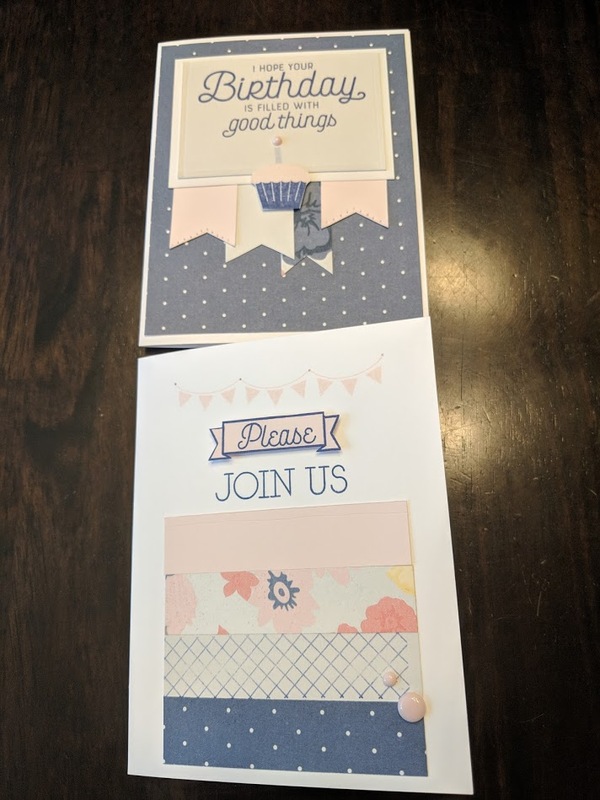 I had my mom and another friend over and we made greeting cards. 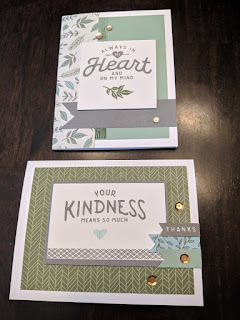 The cardmaking kits from Close To My Heart now come with most of what you need, and easy instructions to assemble the cards. The first cards we made were the Festive Birthday kit (G1157 for $18.95). In addition to the kit, we needed two stamp pads (Bashful - Z2819 and Sapphire - Z2848), the Piercing & Embossing kit (Z2046), and 3-D Foam Dots (Z3342), as well as some acrylic stamping blocks, paper cutter/scissors, and adhesives that we already had on hand. The second card set we made was In My Heart (G1156 for $19.95). In addition to the kit, we needed three stamp pads (Charcoal - Z2831, Glacier - Z2841, and New England Ivy - Z2835), the Edge Distresser (Z1297) and Thin 3-D Foam Tape (Z2060, which I actually used in place of the 3-D foam dots for the last kit as well). I also used acrylic stamping blocks, paper cutter/scissors, and adhesives that I already had on hand. I again followed the instructions as printed and included with the other supplies. For a little variety, the print of the leaves on the top card and the stripes/leaves on the bottom card is actually two sides of the same sheet of paper, so you could use them interchangeably. I absolutely love crafting kits. 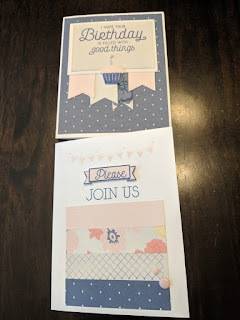 The kits in both cases included the stamp sets, the variety paper, the card bases and envelopes, and the embellishments (I think they were called dots in the first kit, and sequins in the second). I have some paper scraps left, and lots of the embellishments from both kits. And of course I can use the stamp sets again and again! If you're like me, and kind of creative, but like guidance, these cardmaking kits are great. You can see all of the available kits on my friend's Close To My Heart website. I'd love to see what you make! Those are really cute cards! What a great project! I rarely send or receive paper mail anymore, but when I do, I like to use beautiful stationary to make it "worth the stamp". What a fun, crafty option to make some stand-out cards! These look nicer then some of the ones you can buy at the store. Way to go! Very nice!